Great one! Wonderful blue hour sunset shot. Marching across the landscape! Great sky, too! Wow what an amazing photo. I love the sunset and the pylons look so awe inspiring. You captured so many of them. Fantastic photo, well done. Wonderful picture. Feels like something I'd read about in a sci-fi novel! Looks like they are even coming in different shapes or sexes! Good composition! Sometimes I hate pylons but these really make an excellent shot. Fav! POWERful sunset! Strong image with brilliant color pop. Love the different tones and how the wires draw us into the shot. Beautiful. Great capture, sunset and lines... and of course the title. What a lovely sunset over the transformers! That was the day of the snow storm in Toronto! 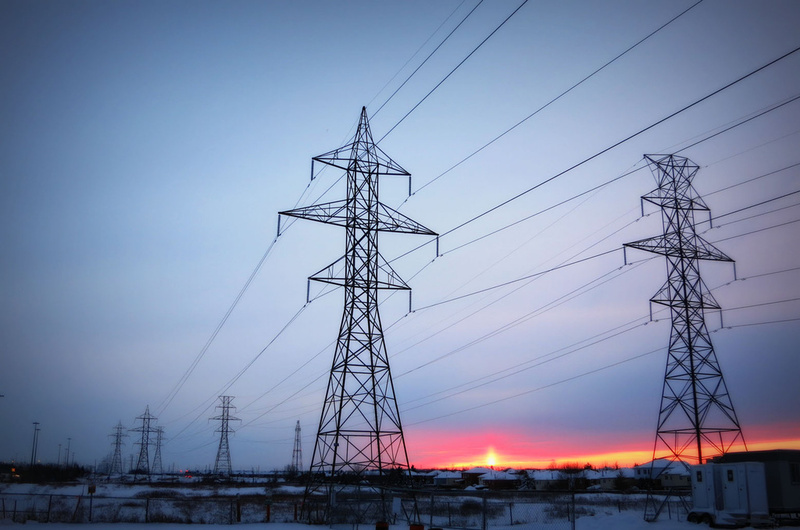 There is a beauty in these utility structures - and that sunset - wow! Fav.